I believe that your Bridals are a vitally important aspect of your Wedding Story, which is why I always encourage my Brides to allow me to capture amazing portraits of them, in a Bridal Portrait Session. And to make the most out of your Bridals here are a few tips I want to offer. Nothing will ruin the portraits or your Bridal Portrait Session faster, than a dress that doesn't fit and flatter your body. That's why its so important to have a fitting at least one time before, and as close to the day of the Bridals as you possibly can. When I work with my Brides on coordinating the Bridal Portrait Session, we take a lot of things into consideration. Like location and access to that location, availability of the hair and make up artist, where will hair and make up be done, what time of day we plan on shooting, and of course when the dress is going to be ready. I always stress when working with your Dress Shop, let them know if you plan on doing a Bridal Portrait Session, and work with them on a couple options on when fittings can be done, so you can plan your Bridals around that. I've had my Brides and the Bridal Shops actually do a fitting just a few days before the Bridal Portrait Session, and it's worked out beautifully. One of the benefits of doing Bridal portraits is that you get to run through and see how you will look with your hair and make up on your Wedding Day. This is why I always stress to my Brides, if at all possible, use the same hair and make up artist that you plan on using on your Wedding Day, for your Bridal Portrait Session. Practice. Sounds strange, but practice makes perfect, right? Even professionals need practice. That’s how they became professionals. And this is the perfect opportunity for your hair and makeup artist to practice their craft and style you to perfection. Why is it so important? This is where the professionals you selected, will be able to discover any issues that might arise on your Wedding Day, and act quickly to solve them now, and not have to deal with them day of. What if your hair stylist finds out they need a different product or equipment they weren't thinking about? Or your makeup artist discovers a tweak she has to make to get your look perfect. By being there for your Bridals this gives them a chance to make sure they get everything right, address any issues that might come up, and be 100% prepared for your big day. If you feel something isn't quiet right, this would be your chance to change it. Maybe you find out that you want to make a small adjustment to how your hair is styled, or maybe you want to slightly change a particular color with your makeup. Whatever it is, if there is something you don't like or just want to change, this is the time to do it. The last thing you want is to discover on your Wedding Day, is that something just isn't right, or worse, you don't like the way you look. Timing. Going through a full hair, makeup, and putting on the dress, will give you and opportunity to see how long each of these things actually take. What if you discover your hair takes 90 minutes instead of an hour? How is this going to affect your timeline? What adjustments are you going to have to make? What if your makeup takes just a bit longer than anticipated, or you discover a couple issues when getting into your wedding dress? This is where you can flush all these things out, get them fixed, and make the right adjustments to your timeline, way in advance of your big day. Better to be late to your Bridals than to your own Wedding. I always ask my Brides if they have someone they can bring with them who is going to be able to help them get into their dress, help them carry the dress when going to location, and someone that can be there to offer moral support. It's an important day. This is the first time you will actually see yourself exactly how you will look on your Wedding Day. So don't be surprised if emotions are a little high. You want someone there that you trust, and can lean on. I usually ask if they can bring a sister, Matron of Honor, of a really good friend. I like to have an assistant accompany me to all my shoots if possible. And when I am doing a Bridal, I always do my best to bring a female assistant. This way if needed, she can help adjust the Bride's dress during the shoot, assist the Bride with posing, holding lights, and helping me with whatever I need. She can also help the Bride get ready, or getting out of the dress when it's over with, but I always find if the Bride has someone there who she knows and trusts, this always helps the day go by a lot easier. This really only applies if you plan on using your venue as a location to take your Bridal Portrait Session, or you want to use a location that requires special access. I'll advise my Brides, when they start looking at venues, always ask if they will allow you to schedule a day to take your Bridals. Every venue I've ever worked with has always been accommodating to this. However this does take some planning. Since venues only make money when it's booked, you'll find that you have to work around the events they have scheduled. Rule of thumb is that during the week is a lot easier to have access to than on a weekend. So my suggestion is let's try to plan this on a weekday or if we can a weekend that they don't have any events happening. Two things we don’t want to have happen, is being rushed to get done and leave, and also, we don’t want to contend with any decorations for an event they are planning, where we may want to shoot. Ask them about taking your Bridal Portrait Sessions there and if there are any additional costs. Plan around a time where they don’t have any events and won't have decorations up anywhere. If you want to use a place that requires special permission, say like a luxury hotel, that may require permission from hotel management and even a permit. It's always best to find out this information in advance and do all your due diligence before hand to avoid any issues with using the location. One of the worse things that could happen during your Bridal Portrait Session, is that your fiancé sees you by accident, before your first look, or walking down the isle. And it could happen. What if you just happen to be somewhere that he drives by and gets a glance, or maybe you decide to try something creative and go to an old hangout, and just by chance he happens to be passing the time there, waiting for you to be done. The main thing is, you don't want him seeing you before your big day, so make sure he stays home. I take the time to plan with my Brides. I'll be there with you every step of the way. From coordinating with hair and makeup, location scouting, and timing, I work very closely with you to make sure we plan carefully and everything comes together on the day of the shoot. One of the unique offerings that I bring to my Brides, is a studio session, in addition to the selected location. During the Bridal Portrait Session, we'll spend a good amount of time together, usually anywhere between 4 to 6 hours. I like to use some of that time in studio. This is where I can control every aspect of the portraits I capture. I utilize a spacious area, professional lighting equipment, backdrops, and staging to create stunning, heirloom quality portraiture. One of the best things about taking Bridals on location, if they are outdoors, is utilizing the beauty of natural light. 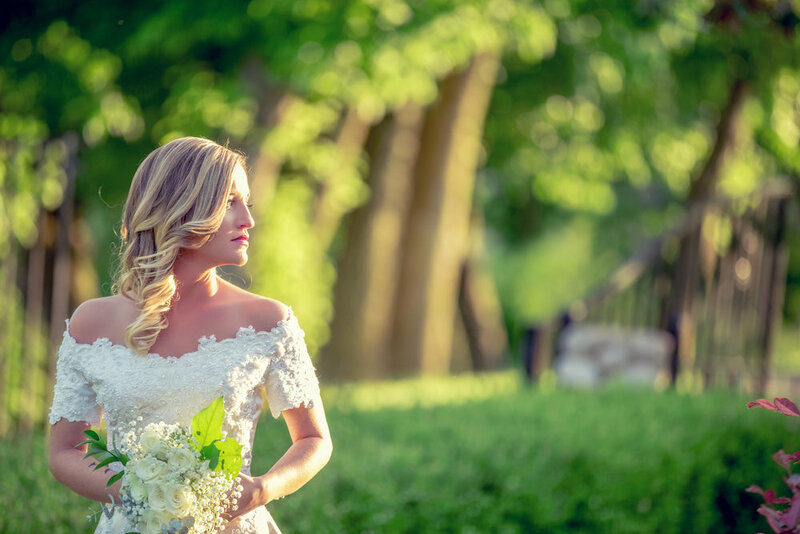 I work closely with my Brides, to plan the timing of the whole day, so we know when the best light will be, at the onsite location we chose, and can take full advantage of what Mother Nature has given us. I always make sure, that I know the location, the best places to photograph in, and exactly when and where the best light will be. But I also always make sure to come prepared. I don’t like limiting my creativity when it comes to using lighting, natural or artificial. So I always make sure to have the right equipment available, whether it becomes a necessity, or I see an opportunity to create something magical. So I'll always come prepared with different reflectors, and off camera flash, to make sure we get the most out of the location. If you would like to learn more, and schedule a consultation, please click the button below.